One of my favorite authors when it comes to books about time travel is Marianne Curley. She is an Australian author, and has only written four books (a trilogy and a standalone), but they are superb! Her books are funny, magical, riveting, and completely original. I love them. I love time traveling. I wish there were more YA time travel books. 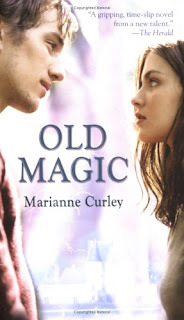 Marianne Curley's books were fairly popular about four and five years ago, but the sad thing is, they've sort of fallen out of the spotlight. Well hopefully not anymore! Jarrod Thornton is mesmerizing, but Kate Warren doesn't know why. The moment the new guy walks into the room, Kate senses something strange and intense about him. Something supernatural. Her instincts are proven correct a few minutes later when, bullied by his classmates, Jarrod unknowingly conjures up a freak thunderstorm inside their classroom. Jarrod doesn't believe in the paranormal. When Kate tries to convince him that he has extraordinary powers that need to be harnessed, he only puts up with her "hocus pocus" notions because he finds her captivating. However, the dangerous, uncontrolled strengthening of his gift finally convinces Jarrod that he must take Kate's theories seriously. Together, they embark on a remarkable journey -- one which will unravel the mystery that has haunted Jarrod's family for generations and pit the teens against immense forces in a battle to undo the past and reshape the future. Sounds awesome, huh? I LOVE this book! And now the totally rocking Guardians of Time Trilogy (published by Bloomsbury), which is full of plenty of mystery, intrigue, action, and just the right amount of romance! Ethan lives a secret life as a Guardian of the Named. Under the guidance of Arkarian, his mentor, and with the help of Isabel, his unlikely but highly capable apprentice, Ethan has become a valued member of this other-worldly corps. As the only defense against the evil Order of Chaos, the Named travel through time to prevent the Order from altering history and thereby gaining power in the present and the future. As the threat from the Order intensifies, secrets of the past are revealed and villains and heroes are exposed. This gripping fantasy is set in modern times, but is infused with intrigue from the past, super-natural characters and surprising plot twists. Curley has written a winner through to the end. Ethan and Isabel, heroes from The Named, are on a more exciting journey than ever and are joined by Isabel's brother Matt, who is still getting accustomed to life in the Guard. Arkarian, their ageless mentor, has been kidnapped and sent by the Goddess of Chaos to a frighteningly dark underworld. His friends have been forbidden to rescue him, but and ever-increasing connection to Arkarian drives Isabel to convince Ethan and Matt that they must risk everything to find him, despite the consequences. Each of the characters must face the demons of their inner-self and draw upon what they find in their hearts in order to succeed. Told from the perspective of both Isabel and Arkarian, this sequel stands on its own as a testament to the power of friendship and the strength of love. In the thrilling, final installment of the Guardians of Time trilogy, tentative guard members Matt and Rochelle have emerged as crucial players in fulfilling the prophecy of the Named. Matt has learned that he is the son of an immortal, while Rochelle is struggling with her newfound powers and her fear that the group doesn't trust her. In fact, their leader is certain that someone in the close-knit circle is a traitor-but who? As suspicions mount, friction threatens to tear apart the Guard. Will the members of the Named be able to overcome their fears and unite the Guardians of Time in their last stand against evil and chaos? Thanks for sharing these titles! I knew I'd seen something about Old Magic before, but this just motivated me to place a hold on it at my local library. Awesome. Wow these sound great. I'm definitely putting them on my list! OMG! I loved Old Magic. I read it when it first came out here I think. I never knew she wrote any other books. Thanks for the information. Do you happen to know if she is writing anything new? I've never read this--I'll look for them! Thanks. Yay! You guys don't know how happy this is making me! Go read these books! And Anonymous: I don't know! I've checked the Australian Amazon.com and the US one, and I've Googled her, but her website doesn't have any recent info! Marianne Curley is one of my favorite authors, so I'm super glad you featured her. I really hopes she writes more! Are there any other books that you've found are similar to these ones? Wow, I love, love LOVE that OLD MAGIC cover. I'm really wanting to read this book now! 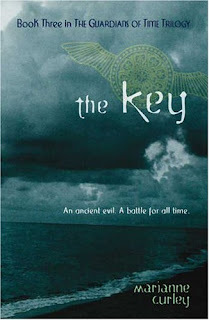 I LOVE the Key books, they're just incredible, and seriously need to read Old Magic.